From your emergency kit, to your car or beach bag, Safety Charge is the perfect device to have with you. Its durable, weather resistant and will never run out of power! 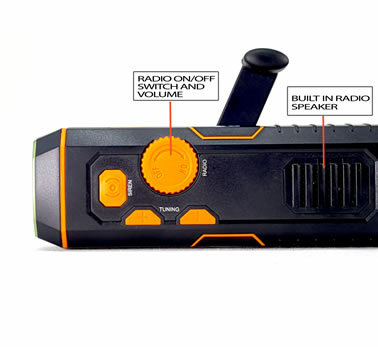 With this device, you will always have an emergency radio, flashlight, siren, and device charger! Best of all, you will never have to worry about this running out of batteries. Safety Charge, is always ready to answer the call! Being in a situation without power, lights or a way to communicate could be life threatening. That’s a fact. This is the reason why having the best solution at hand at all times is important. 1Tac spent months designing the newest line of Emergency Safety Tools. The Emergency Safety Charge by 1TAC. It's a 4 mode crank charging flashlight, emergency siren, radio and USB charger all in one. This is the right device for any situation. 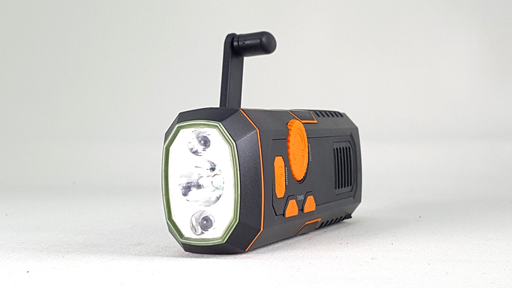 This is a tough advanced design crank gyro self-charging unit, that means NO BATTERIES needed, seriously this is a bulletproof, lifesaving tool that will never let you down. You can have total confidence in any situation, just crank, charge and go. 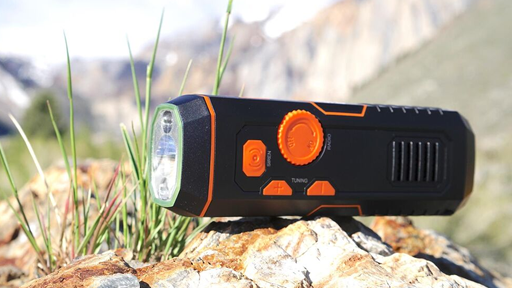 With a super powerful dual-mode flashlight that can last for hours on a full charge, you always know you'll have light no matter what your battery situation is or how long you're stuck without power. 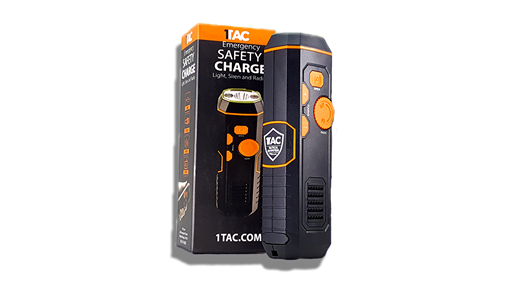 A complete all-in one emergency device the 1TAC Safety Charge has it all. The Safety Charge has enough juice to fire up most devices, anytime by using the self-charge Crank Gyro unit to keep you charged up. This device does not need batteries. 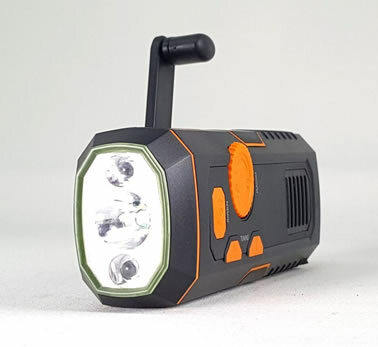 There is a powerfully bright Dual-Mode flashlight to light up any situation to find your way, signal for help and keep you safe. A built-in siren to alert help for miles in any direction. Whether you're stuck in a bad situation, lost on your own in the wilderness, or separated from your group, this could literally save your life. Next is the FM Radio that auto-tunes quickly to local broadcasts for much needed weather, news or emergency info when you need it most. The USB in and out feature is a real life saver if your phone dies or any other electronics need power. Feel confident when you are outdoors especially early or late in the season, as weather can change fast and this can get dangerous, keep updated with local reports. Lightweight, compact and Military tough this device is ergonomically designed to fit perfectly in your hand. This is the ultimate must have survival tool next to fresh water and a knife. When it comes to life saving features, 1TAC has thought of it all and put it into one handy, compact, lightweight, easy to use device. You really should have a few of these, one at work, the house, in your RV, boat, truck, car and of course your backpack. USB Charger Connects to Any Device! The multi-functionality of the Safety Charge makes this device useful for the entire family. 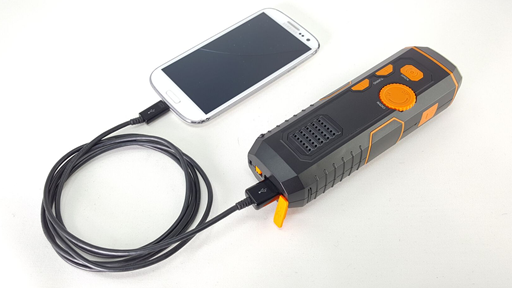 Whether you are on a business trip, on a road trip with the family, at home, working in the garage, at the office, hunting, fishing or camping this device will handle the task. Never leave home without it. How does Hand Crank Gyro Work? The hand crank gyro re-charging generator works by a magnetic field inducing a voltage into a coil of wire. The magnetic field (or the coil) needs to be in constant motion to produce/induce the electricity into the coil. This can be done by moving the crank in a circular motion around in ac circle continuously over time thus moving the magnet which in turn charges the coil. When you need a USB with power, a light, a radio, a siren to alert someone, Safety Charge is the only one of it’s kind that has everything in one device. Lightweight, compact and Military tough this device is ergonomically designed to fit perfectly in your hand. Just crank the gyro handle on the device and you have a charging unit for all your needs. It will never run out of power as it does not need batteries. Stay looped into the world with the built-in FM radio. Light the way with the bright emergency dual-mode flashlight. Keep your devices charged with a built-in USB charger. Sound an alarm when there's danger nearby an emergency siren. This is the ultimate emergency utility tool on the market. Keep you and your family safe and secure.